Did you know that Montgomery Dentistry offers FREE teeth whitening to our patients? Whitening and bleaching teeth are a very common request we hear in our office, so we decided to make it free for our loyal patients. Our technique is simple and gently lightens the enamel of your within a short amount of time. 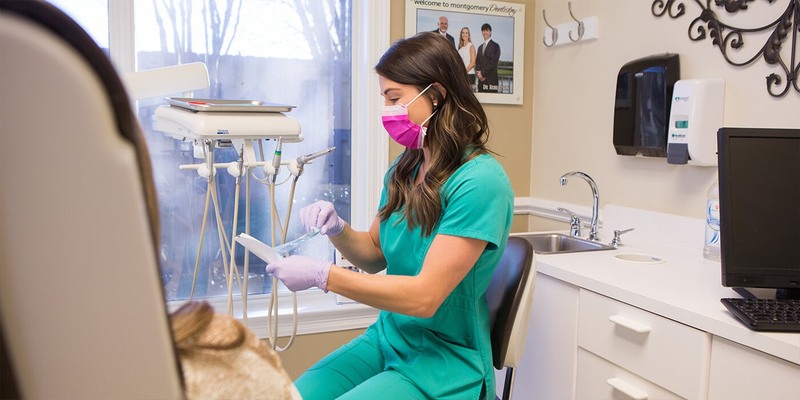 We also take great care to make sure the whitening of your teeth will match any of your crowns or fillings, since only natural tooth enamel is capable of being whitened. Therefore, we may advise replacement of any restoration work you have received so that they’ll blend with your new, whiter smile. We have learned that those who enjoy tea, coffee, and wine are the best candidates for this procedure since these substances tend to stain and dull a tooth’s enamel over time. However, everyone’s enamel has a tendency to lose its luster after years of “wear and tear,” so do not hesitate to ask for this all-too-common service offered at Montgomery Dentistry!